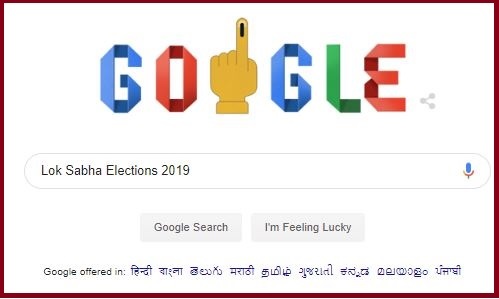 Search engine giant Google on 11th March 2019 is marking the beginning of the world's largest India's Lok Sabha Election-2019 with a colorful doodle. Today Google with a colorful doodle is educating Indian citizen to must use their voting power. It is also informing candidates how to vote, what is the eligibility criteria and what is the significance of voting. The first phase of Lok Sabha elections 2019 starts from 11th April 2019. Under it, 91 Parliamentary constituencies spread over 18 states and two union territories will go to polls in this phase. The voting time in most of the Parliamentary Constituencies going to polls in the first phase is from 7 AM to 6 PM. However, in Left-Wing extremism-affected areas and the North Eastern States, the timings vary. All parliamentary constituencies of Andhra Pradesh, Arunachal Pradesh, Meghalaya, Mizoram, Nagaland, Sikkim, Andaman and Nicobar and Lakshadweep, Telangana and Uttarakhand will go to polls in this phase. Besides, Assam, Bihar, Chhattisgarh, Jammu and Kashmir, Maharashtra, Manipur, Odisha, Tripura, Uttar Pradesh, and West Bengal will also vote in this phase. Also, voting will also take place for single phase Assembly elections in Andhra Pradesh, Sikkim, Arunachal Pradesh and for 28 of 147 seats in Odisha. In Andhra Pradesh, election to all 25 Lok Sabha seats and 175 Assembly seats will take place on 11th April 2019.